Today I'm answering a question that's been circulating a lot on this here blog. 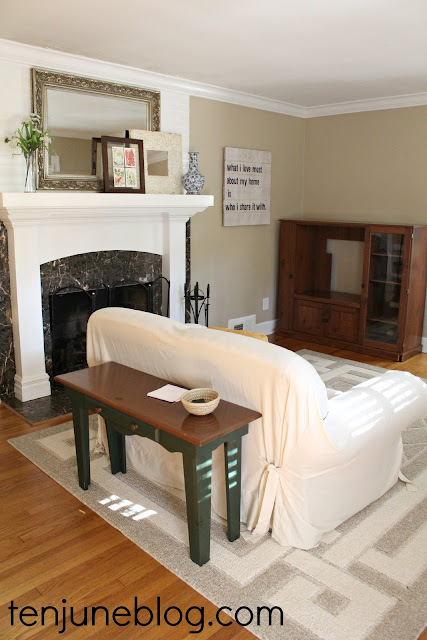 Since David and I relocated our main living space from the formal living room to the larger slate room, what did we do with our old living room? Well, it's officially a steam sauna room. Just kidding. It's David's trophy room where we've hung all of his stuffed armadillos and opossums. Kidding again. Those are in the basement. But seriously... the old living room? It's still a living room, but it's just kind of... well, nekked. That's the Southern form of naked, in case you were wondering. We've stripped down the room and added some extra furniture from around our house. Let's check it out. Here it is before we moved out of the space, in case you forgot. It looks substantially similar, but with a lot less furniture and a few different decor choices. We moved our Pottery Barn sofa, Target slip chairs, new Pottery Barn rug, TV stand dresser and refinished coffee table into the slate room. The mantel decor has more or less stayed the same since I refinished the space here. I've also kept my DIY rustic wall art in the formal living room, for now. Eventually I plan to move it into the slate room when I actually get to hanging things on the wall in there! The couch in the room is a slipcovered hand-me-down that used to sit in our basement. The old school TV stand is a hand-me-down as well. My sister plans to take it off our hands, eventually. You can also see we added that wonky little console table behind the sofa. The table is pretty ugly but it's been a nice place to throw our keys and mail when we first walk in the door. 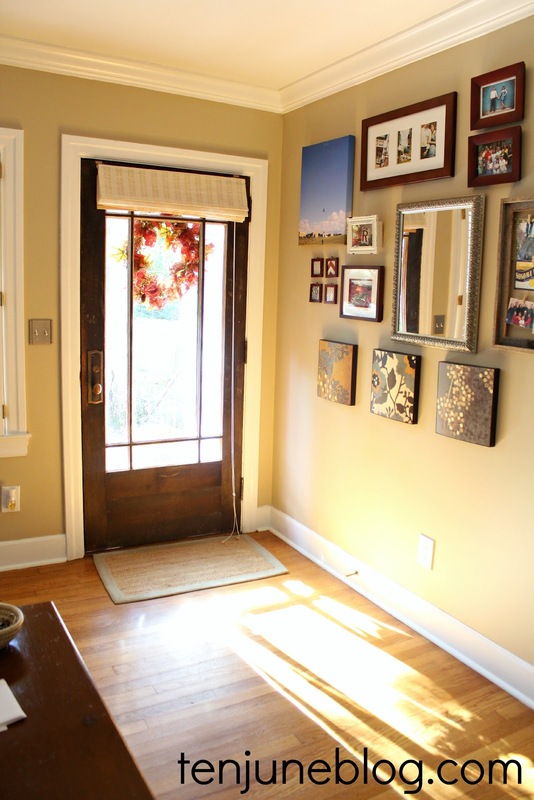 The front door and our gallery wall has also stayed the same. I love seeing that wall when we first walk in the house, so I don't forsee changing it anytime soon. By the way, who loves that one sad pillow floating on the couch? Not me. That's called the "I'm a brand new momma and I don't have the energy to grab more throw pillows" shot. Oops. The only thing that's new in the room is the rug. A few months ago, Mohawk Flooring sent over this rug for me to review. To be completely honest, I was a tad bit skeptical on having a synthetic rug in our house. All of the other large area rugs in our home are a high-pile, cushy wool. 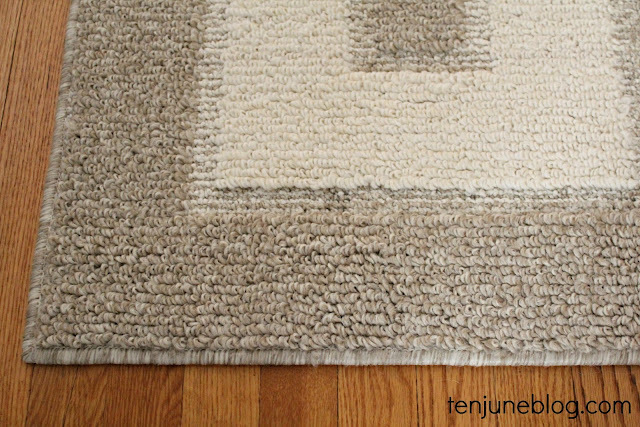 The Mohawk rug is a looped synthetic rug pile. To tell you the truth, though, I love the rug. 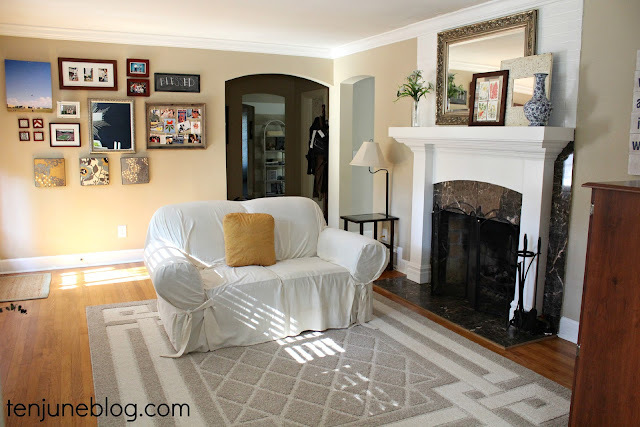 Of course, we don't spend a lot of time in this room now that it's stripped down and we hang out in the slate room, but the rug meets a lot of traffic coming in from the front door and has held up nicely. I was terrified that Tucker's little doggy toenails would rip the looped finish, but he hasn't harmed them one bit! Aside from the good wear and tear of the rug, I love the color and pattern. 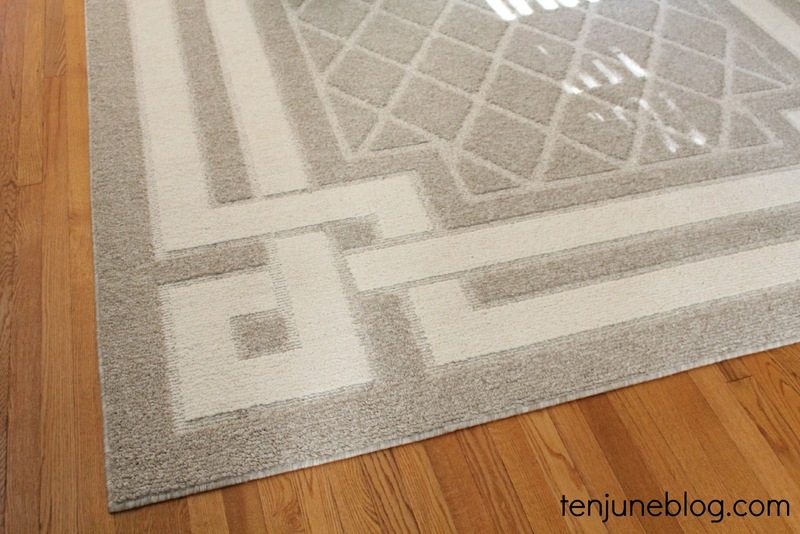 The bold graphics on the rug are toned down by the neutral color palette, which is such a good balance. gee, you could have at least put another pillow on that couch. ;) love the new rug! 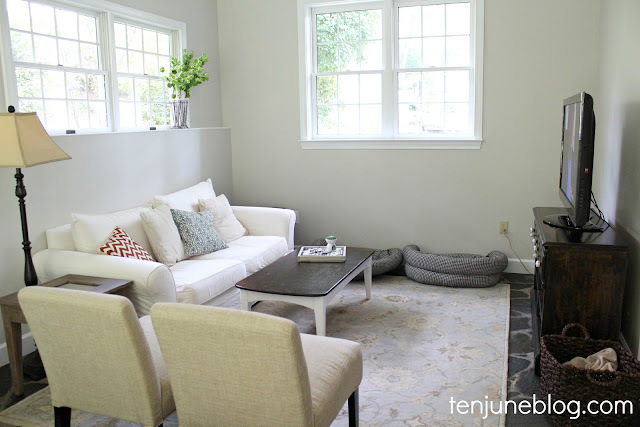 our mohawk rug is also holding up really well to us and our kids and our dogs! i have been super happy with it! I am trying to get over the fact that your cutie patootie son was giving me the finger. . . but moving on;) Love the peek at the nekked room. Was wondering as well. I just love that gallery wall. Hope you're having a great week my dear. Looking at the room (from a buyers perspective), have you thought about putting the sofa facing the fireplace? I figured that you had it that direction for tv watching, but since you created a great family/tv room in the slate room, maybe you could change the layout? Obviously I have no idea if the sofa would work along that wall of windows or even up along the rug, but I figured I'd throw it out there. You could even move that little console table under your collage wall for keys, etc. Just ideas and a fresh set of eyes to *hopefully* get your house sold! Best of luck! The room still looks welcoming! I still love your gallery wall! The rug is perfect for that space! Love that your house is evolving with your changing family needs! I just did a post over on fancylittlethings.com about just that ~ great minds! 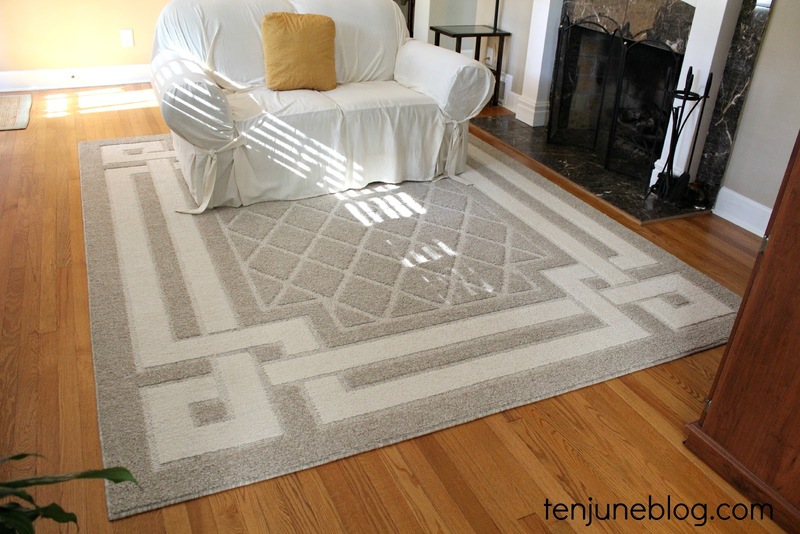 Love the rug -- I just won one of their rugs so I'm anxious to see how it holds up to teenage boy foot traffic!! Awesome carpet! Beautiful space too. My thought was the same as Kristen - floating the couch into the room with it facing the fireplace would look "warmer/more inviting" to me. You could still have the table behind it and it wouldn't be as prominent, yet take up some space. LOL, we're on your side and just trying to help. Thanks for the update! I have some thoughts - definitely swing the couch around to face the fireplace as it's clearly a focal point in the room. I think the couch is too small, so I'd look into swapping it out for a pair of armchairs and put an end table between them with some pictures or a nice stack of books. Things may be kind of nekked, but I really love the rug that's in there! And the room is still really bright and cheerful! You are so clever and creative, I cannot wait to see what you do. Also, I love the slate room. I'm so glad you shared! 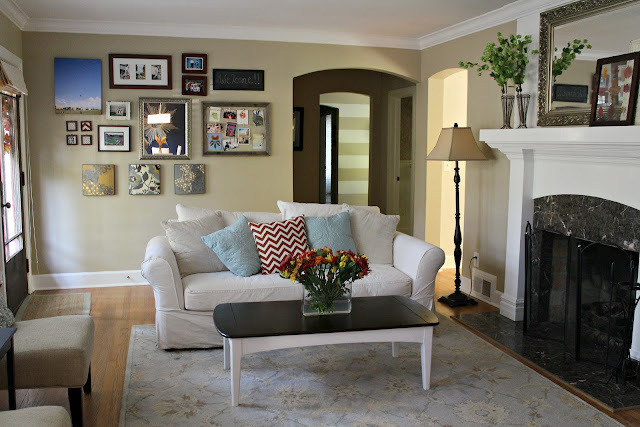 I feel like since the rug is neutral you should do a fun color on the walls :) Or in whatever couch you pick out! 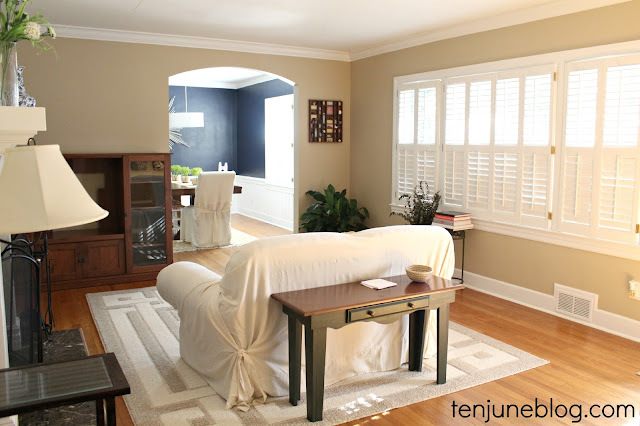 It would be fun to do something a totally different color scheme than the slate room... That rug looks great though! 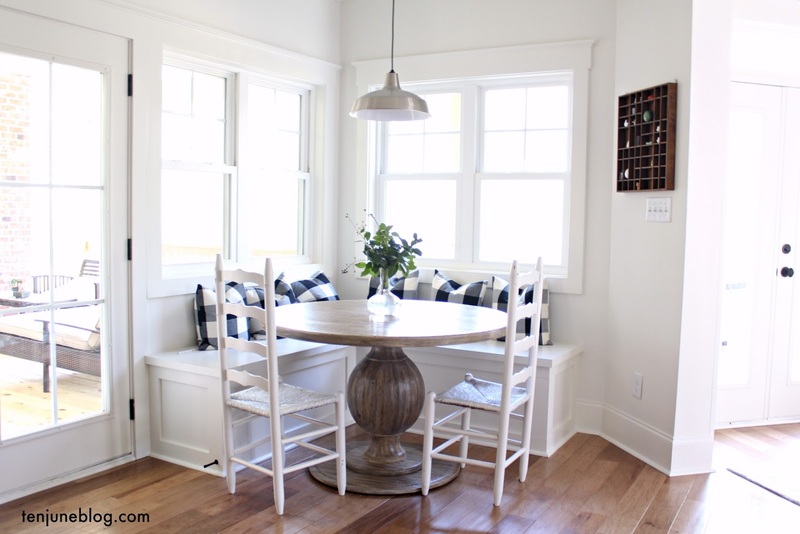 Oh and that table totally has good lines... you could paint the legs black or white and it would look great! I'm coming up with all sorts of ideas for your nekked room ;) Can't wait to see what you do! Looks good, Mich! Hey, when you have a new baby anything goes. I love the slate room so much, I wouldn't spend any time doing anything to this room!